I came across the photograph of this lovely fellow on an online auction site, and decided to research further. On the bulldog pedigree website, www.bulldogpedigree.com I found exactly the same photograph of ‘Benfleet Crib’, who was a champion. ‘Benfleet Crib’ was bred out of ‘Parkholme Crib’ (born 3.9.1902) and ‘Park Road Beauty’. The owner of the sire (‘Parkholme Crib’) was a Mr. Edmund Albert Vicary, who, according to the 1901 Census, lived at 20 Parkholme Road, Hackney. He was 45 years old, and lived there with his wife Clara and 18 year old son, Edwin. I researched further, and discovered that Edmund Vicary resided at ‘Rona’, Melcombe Road, South Benfleet at the time of his death in 1932, although I would say that he had earlier links to Benfleet, considering the name he chose for his champion bulldog. The painting of ‘Crib and Rosa’ by Samuel Raven in 1817, was a portrayal of two well-known Old English Bulldogs from the same lineage. 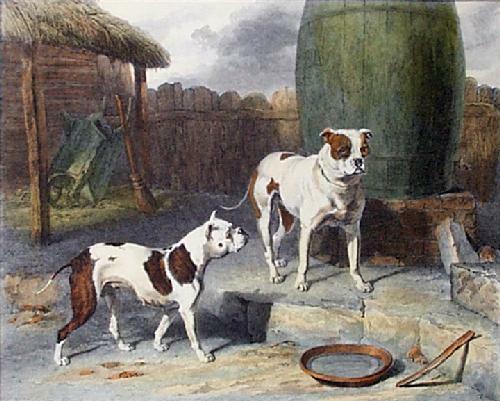 Crib (known as Turton’s Crib) was considered to be ‘the one nearest to perfection by the London Bulldog Club of the nineteenth century. 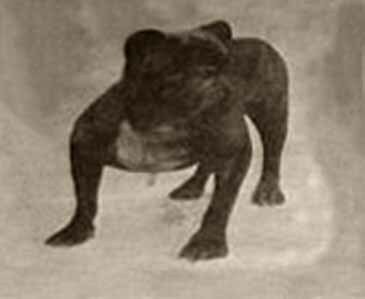 Does anyone remember the gentleman who bred champion bulldogs? Was he one of the many who settled here from London?